The numbers are X and Y co-ordinates in inches, multiplied by a factor (usually 1016). I tend to work in mm, so the conversion factor for mm is 1016/25.4, i.e. 40. This means that there is a possibility for Eagle to accept many file formats, as long as it is possible to convert from HPGL to Eagle script format. Any other format such as DXF can be achieved by using Inkscape first. 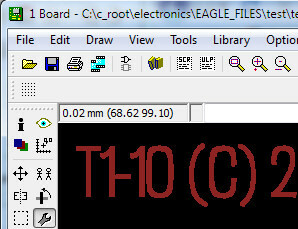 I tested this using a solidworks drawing saved in DXF format, loaded into Inkscape, saved as HPGL, converted to Eagle script format. There is a HPGL <-> Eagle converter executable at the cadsoft downloads page, but it dates to 2003, and it did not work for my version of Windows. Anyway, it was quick to write a simple HPGL<->Eagle converter, the single c++ file is hpgl2eagle1.c. It is compiled using the command line “g++ hpgl2eagle1.c”. It accepts two parameters (the source HPGL file and the destination script file). The conversion factor (40) is hard-coded, but it is easily edited. The executable is here for Windows: hpgl2eagle.zip but better to compile from the source, in case you need to modify the conversion factor. Wow, thanks, this works so much better than import_dxf_polygons.ulp.